Al Gore in An Inconvenient Truth. There are several ways to send a message. You can be bold and yell from a rooftop. You can be subtle and mention a theory in passing. Or if you really mean business, you can make a motion picture and, in order to reach even more people, organize an army to disseminate its message. 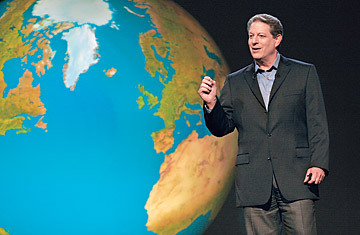 Former Vice President Al Gore's 2006 documentary An Inconvenient Truth grossed over $20 million, earned two Academy Award nominations and was widely credited for bringing the issue of global warming into American living rooms. But Gore's team believes there are still many regions throughout the country  particularly in the Midwest  that still have not gotten the message. Now through the Climate Project  an initiative to spread awareness and challenge citizens and governments to take action against the effects of global warming  Gore has trained nearly 1,000 of his foot soldiers to give the same presentation that he delivers in the movie. His disciples, who are required to give at least 10 talks a year, are not just scientists but volunteers from all walks of life including teachers, housewives and even celebrities like Cameron Diaz. The Climate Project brings a personal element to groups that may have never encountered the film, says Kalee Kreider, Gore's communications director. "The trainees have given his version of the slide show more times than Vice President Gore," Kredier adds. "That's really the goal for them, to reach down in where the movie and Vice President Gore cannot reach." Gore's "cavalry," as he calls them, can also do something else the movie can't: talk back to the audience. "I can answer questions better than Gore can in the film," said Ken Mankoff, by night a soldier for Gore and by day a computer programmer who develops models at Columbia University. Mankoff and his fellow volunteers were handpicked from nearly 5,000 applicants based on public speaking abilities, scientific knowledge and diversity. Gore has already held six two-and-a-half-day training sessions and plans to hold two more this spring  one in Nashville and another in Cambridge. Aside from travel expenses, the sessions are free for all volunteers. During this global-warming boot camp, Gore stands in front of his cavalry for about 12 hours and explains the slide show presentation he gives in the movie. The volunteers are not required to follow a set script, but Gore offers specific advice on how to engage the audience and use metaphors to explain complex scientific information. A scientist on Gore's staff is present during the training to answer any technical questions posed by the volunteers, and a professional speech trainer offers public speaking advice. Although Mankoff finished training only three months ago, he already has 10 talks scheduled before March around the country, everywhere from high schools and church groups to city hall. So far, he says he has been overwhelmed by the community's reception to the program, adding that 90% of the groups he reaches out to are eager to have him speak. "It's a powerful presentation and people are really moved when they see it," Mankoff said. "The movie may exist, but people are more likely to see it if they find out that some community event is occurring around it." One of the stops on Mankoff's tour of duty this week was Bronxville High School in New York, an environmentally friendly school whose student faculty legislature (SFL) created a Global Warming Day based on An Inconvenient Truth. The event drew some of the top scientists around the country and one of the most infamous global warming deniers, Richard Lindzen, a professor of meteorology at MIT. "We are trying to introduce students to this idea that we don't talk about in school," said Alex Tarantino, a senior at Bronxville High School and secretary of the SFL. "We should be talking about it." There's no doubt that they got students talking. Right after the film, Lindzen, who has criticized Gore's "shrill alarmism," sent the students into an uproar when he stood on the stage and said, "Al Gore lied to you. Everything you have just seen is propaganda." After Lindzen's remarks, the students broke into smaller groups. Mankoff told his group of 11th and 12th graders that Lindzen was wrong and Gore was right. "Gore has the entire scientific community behind him," Mankoff said. "In the scientific community, I believe that Lindzen stands alone." While the panelists criticized Lindzen's appearance, the school felt it was sending the right message. "It's important to teach kids to hear all sides of an issue," said Terence Barton, the principal of Bronxville High School. "There is so much being thrown at them and they need to learn to filter out the right information." There may only be a few like Lindzen, but now there's an army of Gores, who vow not to stop until their message is heard.